In the bitter January cold, I set off with my biggest coat, boots, hat, scarf, gloves and kit and trotted off to Chapel Barn. There I met some amazing suppliers, al brought together by the super talented Illy Goodall, and we created some absolute joy A.K.A our festival pineapple styled shoot. I have been wanting to share these beautiful images for some time now and the great news is the shoot was published on Bespoke Bride Blog and can be seen in full here! When Illy and I discussed the look and style of this shoot, I immediately knew I wanted to use a bright pop of colour on the lips, to tie in with the coloured sash on the dress and the bright shoes. I used MAC’s Candy Yum Yum mixed with few other goodies from my kit to create a bespoke colour that worked for Melodie’s complexion. I then kept the rest of Meldoie’s makeup pared back but with some definition on her big blue eyes. Melodie’s hair is long, like really long, like down to her bum long. I knew that I had wanted to do a plait and incorporate flowers into the style but it wasn’t until Melodie was in my chair and I was having a play around, did I decide that I would do a pull through braid on her. I love a pull through braid, it looks cool and lasts really well, so a great choice for a wedding day! This was such a fun and creative day – meeting and working with awesome suppliers. Thanks so much for inviting me along and asking me to be apart of it. I loved it all! 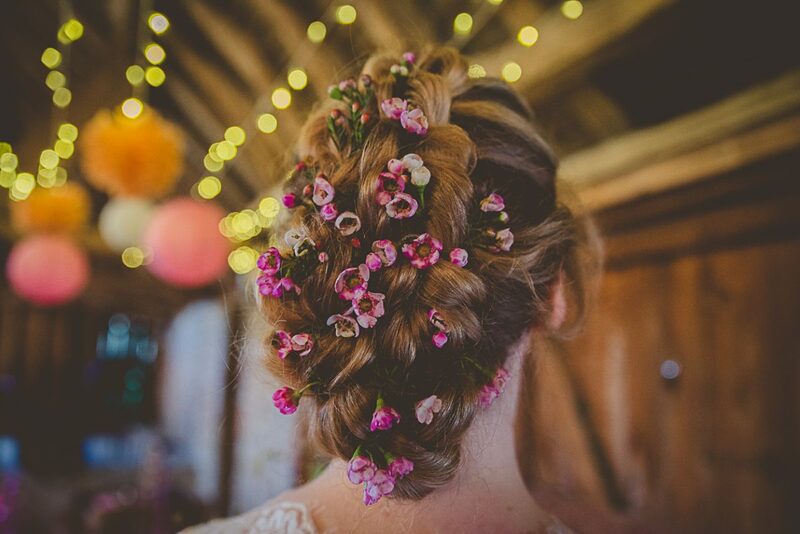 Make up and hair by Surrey based bridal make up artist Arabella Hewitt; at Chapel Barn wedding venue near Haywards Heath, West Sussex.